Spoons, a type of lure that has been proven over and over to be successful by many a fisherman. They are not like spinners and act in a little bit different way. The best trout spinners tend to impart more of a wobbling action through the water. However, a trout spoon does the same thing as a trout spinning lure. It acts as a flasher and attractor and calls in the fish as well. This gives a little bit different of an action that other popular trout lure type. Sometimes, this slight change can make all the difference in the world. Depending on where you are fishing, the action of the lure is important. You can never have too many spoons. There is an advantage of having a couple of different colors of spoons on hand. If you are fishing with the same color, one cast after the other and you’ve got a few short strikes, it means that a couple of fish came up and nipped at it. Switch your spoon up really quick to something that’s a completely different color, and there is a high probability that trout may take it. You will notice when a few fish kind of tend to hit it, but they stopped bothering with the lure because they are used to seeing that same colored spoon. If that happens, switch to an entirely different color, and you will get a better catch rate. Trout are pretty easy to get. You don’t need a boat or anything like that. You can just get some waders, bang around on shore, cast the best spoons for trout. The reason why you would use a spoon is that there are times when there are lots of redside shiners in the water, and if you go closer in the shallow, you can see them swimming around. Bull trout and rainbow trout love feeding on them. By using a spoon, you are imitating what the fish are feeding on. That’s how you get big trout with a spoon. Here are some of the best trout spoons that I’ve seen anglers use all the time. The first spoon in this list is the classic Thomas Cyclone. It’s a popular spoon among anglers for over 50 years. It’s made out of solid brass that has a highly reflective surface. This wobbler-type spoon creates a bright flash. The baked enamel finish gives it a reflective surface that mimics the appearance of a baitfish. It has a nice wobbling effect that tempts strikes after strikes from trout. The classic Kastaway Trophy Spoons from South Bend. This kit comes with three basic colored spoons. The classic gold, silver and a combination of silver and blue. It’s perfect for any outdoor fishing scenario. You can use them for trout fishing, bass and panfish fishing. They are simple, effective and great for the price. The size is somewhat small, but they are relatively heavy. These trophy spoons cast really far. Even on a breezy day, you can cast them a mile. Dubbed as the “Original Weedless Wonder,” this classic hard bait spoon is as effective as it gets. The blade is made out of brass and is designed for long casts. The pure solid plated color flashes brighter than chrome or brass spoons. It won’t roll or twist line because of its 35-degree wobble design. However, it will rock back and forth to create a good wobbling effect. The best feature of this spoon is that it will come out clean and weed-free every time. These spoons can be used for both freshwater and saltwater applications. These silver-colored spoons have a nice color combination that attracts any kind of fish. They come in different colors and sizes. Crocs can be a very versatile spoon because they can be used to catch bass, bonito, barracuda, yellowtail, yellowfin, halibut and of course trout. They are also good in many different bodies of water. Some of them have a hammer pattern, and some are smooth. Williams has always been known for their finishes on their lures. The silver spoons have a solid silver color, and the gold spoons have a 24k finish. These lures have a center keel that helps stabilize the spoon. The big ones are excellent trolling lures. 40 is the smallest the 60 is the biggest spoon they make. There is nothing wrong with casting the W60, it works just as well. These baits are actually too pretty to be thrown into the water. They should be hanging on the wall as a showpiece. The Acme Thunderbolt Spoon is brought to you by the same makers of Kastmaster. These lures are deadly for trout. The temptation is irresistible, and fish can’t help but strike the bait with full force. Whether you are fishing in lakes, streams, ponds or river, these spoons are equally effective. You can use these lures for catching shad, trout, panfish and for ice fishing. The erratic wobbling and darting action mimic a fleeing baitfish which triggers the predatory urge to strike the spoon. If you are familiar with the brand “Abu Toby,” these lures are the same with a different name. At least they appear to be the same. These lures are made in China, probably from the same factory. Now, Abu Toby is a popular brand in European countries, but they do not ship in the USA. This spoon is exactly as it’s described. It’s great, works well for trout, the quality is nice. The weight is evenly balanced, and you can use it in deeper waters. This finish on this lure is durable too. 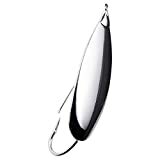 The classic Krocodile spoon from Luhr Jensen is a multi-species lure that you can use for any fish. It has heavy-duty construction and has a corrosion resistant finish. You can easily catch some predator fish with this lure. It has a heavy-weight design with a narrow shape construction. This lure gives out a bold look that mimics the thumping of a baitfish and fish-attracting flash. This spoon is formed and stamped from solid brass and is suitable for both saltwater and freshwater use. How to Choose A Spoon for Trout Fishing? You want to a spoon that can force a trout to attack the lure at full force. Now, there are good spoons and bad spoons. You need to match the size of the lure, color, weight, and action to match the water stretch of your fishing spot. The invention of a spoon lure was by accident. In the mid-1850s in New York, a guy name Julio T.Buel accidentally broke a spoon. Rather than scrapping it, he decided to put a hook on one end and use it as a lure. It was an absurd idea that actually worked. Since then, the spoon has been widely in use by every fisherman. How To Select A Trout Spoon? As I have said before, there are good ones and bad ones. A general rule of thumb is that if you are fishing on rover and streams, anything between 1-inch and 3.5-inch would be sufficient. You can use a small spoon to cover even the shallowest of streams. If there are too many snags, you cannot keep up the speed, and the spoon will end up hitting bottom too easily. You need to size and choose a heavy spoon if you are fishing for lake trout. Same goes for brook trout as well. They usually prefer redshiners which are about 2-inch long. You can use a lead core fishing line or downrigger to get the spoon running at the right depth. In this situation, the weight of the spoon plays an important role. Choosing the right weight can have a significant impact on its action. Keep your spoon choice light and small. It’s best to stay that way if you are spoon fishing on smaller rivers and streams. You can use the rod tip by keeping it up to fish in shallow water. The shape of a spoon is also important. It determines the lure’s movement. 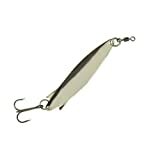 A thin spoon is used when trolling for lake trout because thinner lures will have a more erratic movement than the thicker spoon. On the other hand, a short, thick spoon is better for casting and covering more water. You can use the thicker variation to cast from the shore into large rivers and lakes. I prefer to use a weighted thick lure for all of my cast fishing. As with any trout lure, the color of the spoon will be important. It can have a big effect on your catch rate. Also, it’s better to have different color options at your disposal. Determining what spoon color to go for will depend mostly on weather and water conditions. If you are fishing on the river and you see clear running water, go with the classic colors. For example, traditional nickel and brass, red/white or five of diamonds. If you see darker running water, it would be best to go with a brighter color. Your main priority will be to force a trout into striking. Fishing with an orange/brass, firetiger or a spoon with bright yellow pattern can get trigger a response from trout. Fishing on lakes? Go with the classic gold or silver variations. These are mostly used on lakes. However, I’ve seen a lot of people use blue and green. In all honesty, the patterns are endless. Just go with whatever works for you. There are different types for different fishing techniques. Each has their own perks, so it’s better if you look at them all before you decide to buy one. These spoons are made for casting. They are heavier than their trolling counterparts which in return allows for more accurate throws. These are classically shaped spoons that have a more oval shape. They also have a more noticeable wobble effect which makes them move back and forth from side to side. In short, they are good for casting but not suitable for trolling. The main difference between casting and trolling is that they are noticeably longer and thinner. They will not run as deep as a casting spoon because of their thinness which also makes them lighter. If you want to get the spoon down deep, you have to either add weight, a diving vane or a down-rigger. These spoons are rarely used for trout. They are more suitable for bass and walleye. They consist of a single hook and a hook guard. It helps in reducing the amount of snagging and weight build-up. If you want to target schools of fish, it’s better to go with a jigging spoon. It’s not the most popular option for trout fishing, but this method is gaining in popularity. These lures are generally the heaviest and used with a non-stretch fishing line. Finding a school of fish is tough. You need to use a fish finder for that, and if you want to fish from overhead, these jigging spoons are the way to go. Topwater spoons are not that great for trout fishing. They are mostly used to hunt out musky and bass and other predatory fish in the summer months. You should always reel in the spoon as slow as possible. A general rule of thumb is that to vary the retrieving speed. Rather than keeping a constant retrieving pace, try jerking the rod tip and increase/decrease the retrieving speed from time to time. You want to mimic the swimming characteristics of a small fish. The exact speed of spoon will vary slightly from manufacturer to manufacturer. For example, a casting spoon will require a different speed to a slim trolling spoon. How To Fish With A Trout Spoon? You can use a spoon for fishing literally anywhere. Whether you are targeting river/stream trout or lake trout, there is a spoon for each venue. However, the approach will be different. As I’ve said before, there are thin spoons and thick spoons. The thicker ones run deep which make them best for reaching down to catch early-season trout. They work really well in fast water. For example, use spoons that are available in a variety of sizes. You can go down to 1/8 ounce or less. There are thicker spoons that similar to look at but comparatively thicker in proportion to their overall surface area. The perk of having a thick spoon is that it will cast like rockets. These lures are great for covering lots of water if you are in a hurry. When fishing on small to midsize streams, you should always use the smallest available sizes. On really big water, you can go up to 3/8 or even ½ ounce models. Did you know that you can customize your own spoon? If you don’t want to do that, stick with the basic colors like gold or silver. They often come with colored stripes or spots. The art of fishing trout with a spoon is in reeling. First of all, you should always cast up and try to reach in deep, fast water. Don’t use a steady retrieve — reel in at a pace that is fast enough to keep the line tight. You should also give the lure a darting, tumbling action by pumping the rod tip. You can do a steady retrieve, but it won’t be very effective. You can catch some fish that way, but there is a better approach. Try an erratic retrieve, it will mimic the actual characteristic of a swimming fish, and you will catch more. Thinner spoons work best later in spring. At that time of the season, the water is shallower, and little warmer which make the trout more aggressive. You can never have too many spoons. I like to have a bunch of them in my tackle box because you never know where you are going to fish next. It’s better to carry a lot of trout spoons than live baits. Now, the purpose of this article is to sort out the good from the bad ones. Hope you found the best trout spoons in this list. If you prefer other spoons, do let me know in the comments below. I’ll add them here.